The sun is streaming into the kitchen and it feels great to be making hot-weather food. Step forward salads – with zingy, fresh ingredients and clean, clear tastes. Making food in this heat becomes as simple as putting some ingredients in a bowl. And when it’s this simple, it’s supereasy to make healthy, nutrient-packed meals. 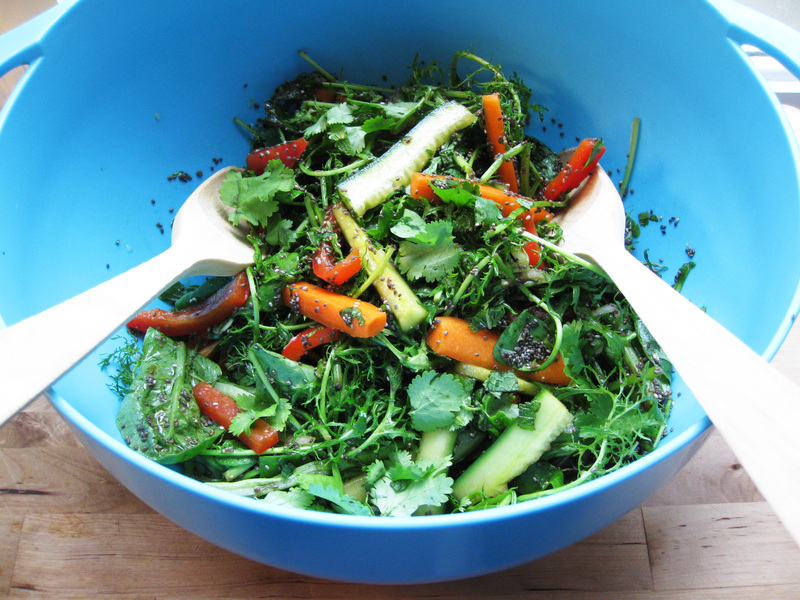 This salad is full of antioxidant-rich veggies. But the stars of the bowl are the chia seeds. They are literally bursting with vitamins, minerals and the highest amount of omega-3 in any fruit or vegetable. You can use chia seeds to thicken stews, soups, juices and smoothies, to bind flour mixtures together as a substitute for eggs when baking, but also very simply to sprinkle into stir-frys and salads. Ahhh, sunshine and superfoods – a wonderful combination! To make the dressing, mix together the ingredients in a small jug. Using a teaspoon, deseed the cucumber by running the spoon down the centre of the cucumber. Discard the seeds and cut the cucumber into thin matchsticks. Put the cucumber and the remaining vegetables into a serving bowl and mix thoroughly. Add the dressing and the herbs and mix in gently. Sprinkle the seeds over the top and serve. Intermittent fasting hit the headlines last year, and hit fever pitch when Horizon broadcasted a programme by Dr Michael Mosley called Eat, Fast and Live Longer, which was watched by two and a half million people. IF is based on the premise that short periods of fasting enable you to shift weight and change shape – but the really incredible thing is that apparently it can radically transform your health as well. Scientific research shows that this age-old practice (dating back to the Ancient Greeks, as well as yogic traditions) of fasting for short breaks of time lowers the levels of a hormone called IGF-1 (Insulin-Like Growth Factor) and, in doing so, protects you from some of the major diseases, including cancer. It has also been shown that IF has potent anti-ageing benefits, and helps reduce inflammation which, in turn, helps with conditions such as eczema and asthma. It’s a diet that is extremely easy to put into practice. There are 3 types of IF. You can follow the 16/8 plan – and eat healthily for 8 hours and fast for 16 (in other words either skip breakfast or dinner). Or you can try the 5/2 plan – and eat healthily for 5 days of the week and follow a 500-calorie diet for the other two. The final plan is the most full-on and least popular of all the plans – whereby you fast for one day and then eat healthily for the next. This is called alternate day fasting. Sounds simple? It is! And that’s probably the main reason why it has become so popular so quickly. You choose the plan that seems right for you and then simply fast when you’re meant to. And when you’re not fasting, you eat healthily. A few IF diet books have been published recently, including one called Eat, Fast, Slim by Amanda Hamilton. The beauty of Amanda’s book is that she shows you all the types of fasting but also shows you how to ensure it’s a superhealthy diet for you. It’s important to ensure that you balance the types of food you’re eating, and especially that you get enough protein and nutrients during the plan. Amanda explains the diets, and explains what you’ll get out of them. And then gives you Fasting Plans and a whole load of mouth-watering recipes. I tried the Grilled Salmon with Harissa Quinoa and it was delicious. The lime-zesty salmon along with the harissa-spicy quinoa was a great combination. And the colours and textures of the food were lovely. Hmmm I think I might even try this IF dieting! Put the salmon on a plate and rub the lime zest over the flesh, then sprinkle with half the lime juice. Cover with cling film and leave to marinate at room temperature for 5 minutes. Put the quinoa in a sieve and rinse well under cold running water. Put it in a saucepan and cover with 160ml/5¼fl oz/2⁄3 cup boiling water. Bring to the boil, then reduce the heat and simmer for 15 minutes. Brush the grill rack with oil and preheat the grill to medium. Put the salmon on the grill rack and grill for 5–6 minutes on each side or until cooked through and the flesh is opaque. Meanwhile, heat the oil in a nonstick frying pan over medium heat. Add the spring onions, courgette and harissa paste, and cook for 2–3 minutes, stirring frequently, until the vegetables start to soften. Remove the pan from the heat, add the quinoa and its cooking liquid and toss to coat with the harissa. Cover with a lid and leave to stand for 5 minutes or until all the liquid has been absorbed, then fluff up with a fork and stir in the coriander and remaining lime juice. 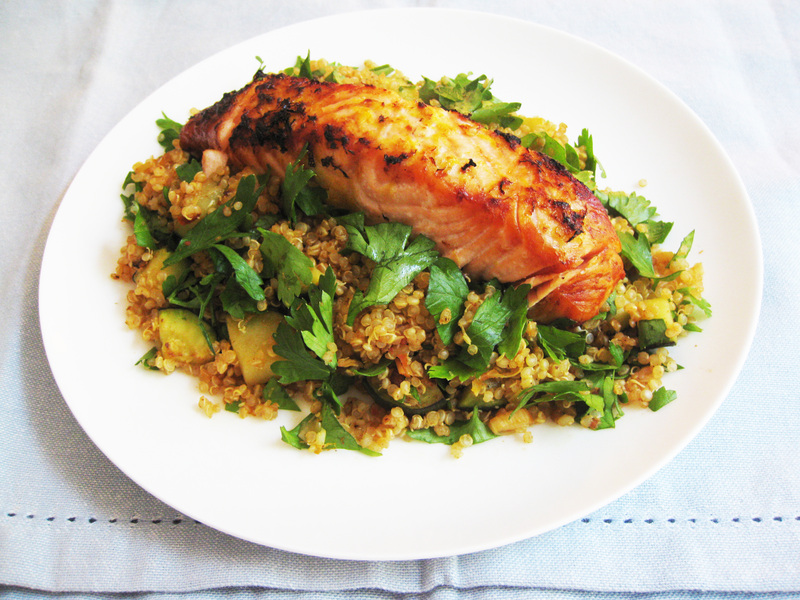 Serve the salmon with the quinoa and a lime wedge on the side for squeezing over. 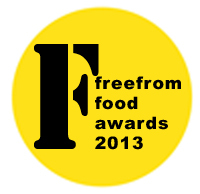 I took part in the judging for a day and was hugely impressed with the whole process. There were 11 of us that day and we blind-tasted every entry in our categories in silence, making notes and scoring each one out of ten. Once we had finished, we discussed every entry and then came to our conclusions as a group. This done, we could look at who had produced what. During the day I was there, we covered Breakfast Cereals and Grocery Ambient, including pastas, sauces and condiments. One of the products we tasted was especially interesting. Shortlisted for the Pasta Award, the Slim Noodles were a subject of a great deal of discussion. Recently launched, it is gluten-free and it claims to deliver not only a feeling of fullness, but also an unbelievably low calorie content (7.7 calories per 100g serving). Made from a vegetable extract called Konjac (or Konnyaku) which has apparently been eaten in Asia for centuries because of its health benefits, it expands in your stomach, leading to the sensation of being full for up to four hours. Zero fat, zero sugar, low-calorie and low-carb, it’s currently being hailed (along with a very similar product called Zero Noodles which is made of exactly the same ingredient) as the answer to weight loss for many, many people. What’s more, independent studies apparently show that it can help increase insulin in your blood sugar levels, making it great for diabetics, and can help lower cholesterol. Wow! Slim Noodles comes in three different guises – Slim Pasta, Slim Rice and Slim Noodles. 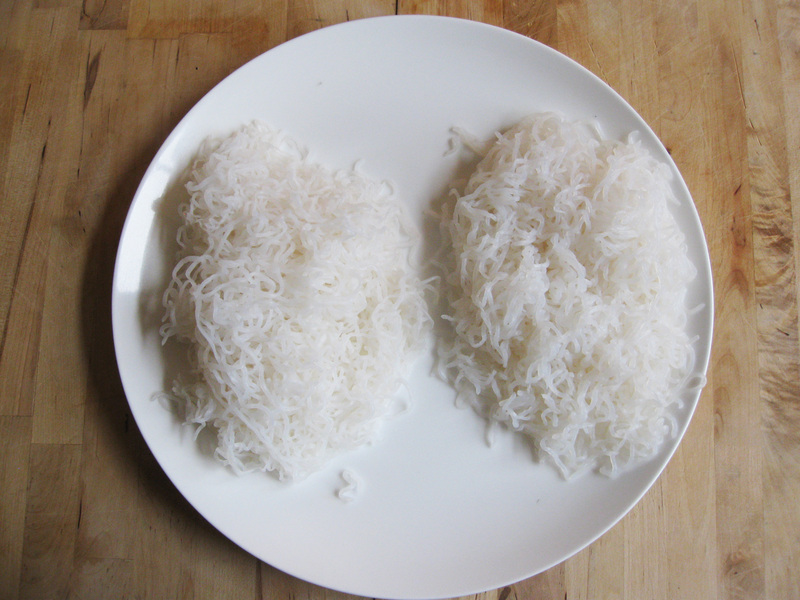 The Slim Noodles – and Zero Noodles – look very similar to glass noodles and thin rice noodles in that they are white-coloured and very thin. They have a slightly rubbery texture (the Slim Noodles I find more so than the Zero Noodles) and almost no taste. I tested these at home this weekend with a recipe (see below) and they both worked really well with noodle-style recipes, such as stir-frys and Asian-style dishes. I haven’t tasted the Slim Rice yet but the Slim Pasta was very similar to Slim Noodles – just thicker, apparently more like a pasta-shape. I’m not convinced about the concept of Slim Pasta, though, as it doesn’t work for me as something that would work with pasta sauces, such as tomato-based sauces, and there was a slightly ‘fishy’ aroma to these, I thought. You’ll find both the Slim Noodles and Zero Noodles in health food stores. In Holland & Barrett the Slim Noodles sell for £2.49 and the Zero Noodles (organic) for £1.99. They’re the same size – so go for the cheaper Zero Noodles if you’re looking to try the product! Put the fish in a shallow, non-metallic dish. Mix together all the marinade ingredients in a bowl or jug and pour over the tuna. Cover with a lid or cling film and leave to marinate in the fridge for at least 1 hour, preferably longer. Spoon the marinade into a large wok and heat over a medium-high heat. Cook for 2–3 minutes until the onion starts to soften and turn translucent. Add the vegetables and then place the fish on the top. Cover with a lid and steam for about 10 minutes, until the fish is cooked through. Serve hot with the prepared Zero Noodles. It’s easy to get stuck in a rut, making the same spice paste over and over again. 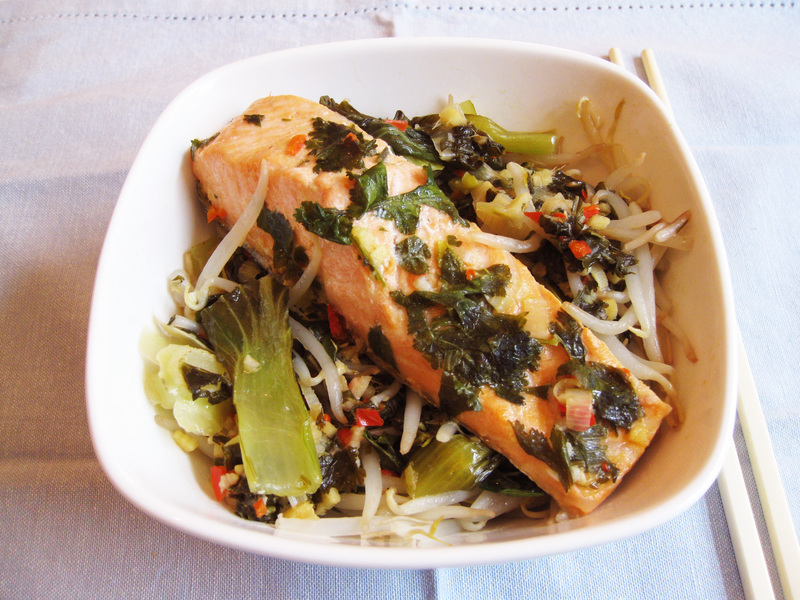 So I tried a new one to make this recipe – from Leemei Tan‘s Lemongrass & Ginger. I have an all-time favourite Thai green curry that I make that is hard to drag myself away from. But it uses a lot of different ingredients so it was great to try this simple paste – especially as it delivers delicious flavours and tons of oomph. Leemei Tan is a food blogger, stylist and photographer. Her blog is gorgeous – full of Asian (inspired by her upbringing in Malaysia) and French/Asian (inspired by her French husband) recipes. Her brilliant book covers recipes from all over Asia – Japan & Korea, China, Philippines & Indonesia, Malaysia & Singapore, Thailand, Cambodia & Vietnam and India & Sri Lanka. Here I’ve tried one of the Malaysian recipes as I’ve become increasingly interested in this particular cuisine. Malaysian food reflects the country’s different ethnic backgrounds. The mixture of Malay, Chinese, Indian, Nyonya, Eurasian and the indigenous people of Borneo has meant the cuisine majors on a fusion of Malay and Chinese ingredients and cooking techniques. Added to that is the effect of the spice trade in the 15th century that brought a wide range of exotic spices to Malaysia, including cardamom, cinnamon, clove and star anise, all of which often play a starring role in the dishes. This recipe is a great one for cooking squid. Squid can so easily be tough and rubbery when you’ve cooked it, so you have to either flash fry/stir-fry or cook it slowly, as you do here, to get a lovely tender texture. And the whole dish is full of punchy, vibrant flavours – delicious! To make the Sambal paste, soak the dried chillies in hot water for 10 minutes, then drain, deseed and roughly chop. Put all the ingredients in a food processor and blend to a smooth paste. To make the Squid Sambal, heat the oil in a frying pan over a medium-high heat, then add the onions and cook until soft and translucent. Add the spice paste and cook gently, stirring occasionally, for 10–15 minutes until fragrant and the oil starts to rise to the surface. Tip in the squid, stir until well coated and cook for about 5 minutes. Add the sugar and season with salt, then add the lime juice and stir to combine. Bring to the boil, then reduce the heat to low and simmer, covered, for 45 minutes, or until the sauce thickens and turns a dark reddish brown. Leave to one side and keep warm. Meanwhile, put the rice, star anise, lemongrass, pandan leaves, if using, ginger, coconut milk and salt in a large saucepan and pour in 300ml/10½fl oz/scant 1¼ cups water. Put the pan over a high heat and bring to the boil for about 20 seconds. Stir with a wooden spoon to prevent the rice sticking to the base of the pan, reduce the heat to low, cover, and simmer gently for 20 minutes. Remove the pan from the heat, leaving the lid tightly closed, and leave to one side to steam for 10–15 minutes until cooked. Fluff the rice with a fork and discard the star anise, lemongrass and pandan leaves, if using. Leave to one side and keep warm. While the Sambal and rice are cooking, heat a frying pan over a medium-high heat, then add the peanuts and dry-roast until fragrant and starting to brown. Tip the peanuts onto a plate, sprinkle over the sugar and leave to cool. Add the remaining 1 tablespoon of oil and fry the dried anchovies until slightly browned. Serve the rice on plates or banana leaves. 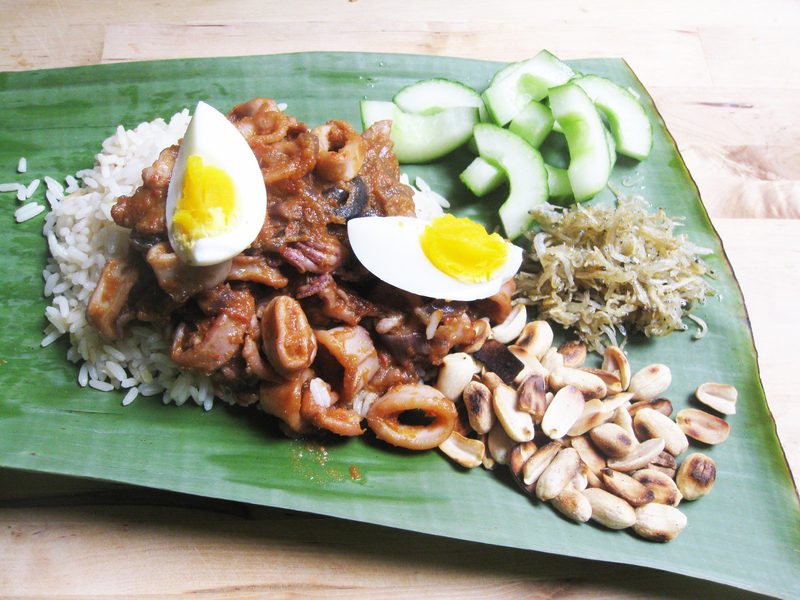 Ladle the Squid Sambal over the rice and top with the eggs. To the side, heap the cucumber, toasted anchovies and sugared peanuts. Serve hot.